Earlier today, an incident commander completed over 30 minutes of live video broadcasting from an accident site during the actual response work. Our LiveResponse-application has now been used during real response work. The incident commander successfully broadcasted a sequence that lasted over 20 minutes without experiencing any technical problems, which indicate that the Bambuser mobilephone client has significant qualities. Together with an additional 10 minute sequence, resulted in some inital data that we will analyse in more detail in the next few days. However, a singel event is just: – a single event. We are looking forward for additional use of the LiveResponse application in order to fully learn how mobile video broadcasting technology could provide new capabilities as part of response work. The LiveResponse application is highly dependent on good data transfer rates, and the current configuration uses the UMTS-network. Note: All data in the LiveResponse application is protected and not publicly available. The picture below shows a still-frame from one of the video sequences along with the google map used for presenting the positioning of the video sequence. 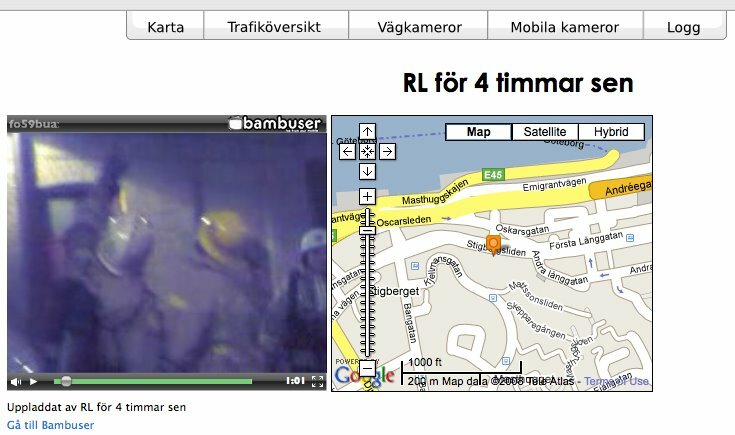 These pictures show that the Bambuser services is tightly integrated into the LiveResponse application. The LiveResponse application is a result by a collaboration between SAFER:Chalmers, Lindholmen Science Park: Security Arena, Viktoria Institute, The Fire and Rescue Services in Gothenburg, The Paramedics at Sahlgrenska University Hospital, and the National Road Authority: Region West.